The tying goal came with 7:15 left in the third off a sloppy clearing attempt by Jaccob Slavin. Nicklas Backstrom, who had been a game-time decision with an illness, got the puck to Ovechkin down low, and from there it was easy work of Cam Ward. 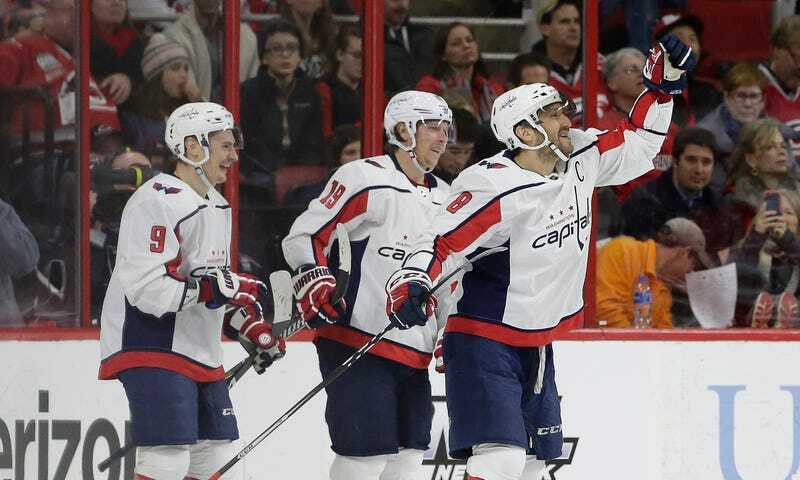 But rather than dump the puck and join Backstrom in heading to the bench, Ovechkin skated in, threw off Slavin with a fake to gain a little breathing room, and got everyone off the ice. A 50-goal season would be Ovechkin’s fourth in five years, and to do so at age 32 would be pretty incredible. He’d be the NHL’s oldest to score 50 since Jaromir Jagr in 2005-06, the season he turned 34. Ovechkin claims he’s not thinking about the milestone, as he might have in his younger years. “Let’s just take it game by game, and then we’ll see what happens,” he said. “You know, I’m not like 25 years old or 20 years old...trying to reach that kind of milestone.